Mouse embryonic stem cells (mESCs) are by definition cells that can self-renew (make identical copies of themselves) and specialize into any cell type of the body. Since their discovery, scientists have used them to produce various specialized cell types in culture but also to produce transgenic mouse lines. When injected into a mouse early embryo, mESCs can become any cell type of the body but can also be passed on to the next generation. Using this technique, scientists have been able to generate hundreds of transgenic mouse models, from which resulting studies have been invaluable for the progress of biology and medicine. However, although mESCs are able to integrate into embryos, mESCs cultured in a dish do not organize themselves into structures that are similar to embryos. If aggregated into balls, called embryoid bodies, they can develop into a disorganized mass that does not resemble an embryo. Very interestingly, van den Brink and colleagues have published, in Development, a culture protocol with which they obtain mESCs structures that exhibit collective behaviors similar to those of the cells in the early mouse embryo: axis elongation, axial organization and early cell specialization. They thus call these structures gastruloids, in reference to gastrulation, one of the key and central process of early embryo development. In this picture you can see the cells of the tip of a gastruloid. The protein brachyury is shown in green, presence of protein TCF/LEF is shown in red and Hoechst (blue) corresponds to the cells nuclei. 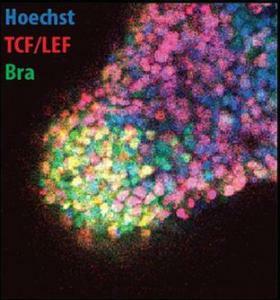 The yellow cells at the very tip express both brachyury and TCF/LEF, a characteristic specific of cells of the primitive streak structure in early embryos. This observation, along with others in the study, suggests that the gastruloids formed by mESCs undergo developmental movements that resemble the ones of early embryos. Although the impact of such interesting observations is hard to determine yet, it is fascinating nevertheless to obtain such complex organized structures in vitro. This hopefully will open new ways of studying early development and disentangle early development mechanisms so far unknown.